First of all, I just wanted to take a moment to welcome you all to the Fall 2018 semester. It’s great to see the campus abuzz with students, faculty, staff, and guests again as we get this semester underway. I also wanted to remind you that Teaching & Learning Innovations (T&LI) is here to support faculty in their teaching to improve student learning. We would love to see you in the FIT Studio (Solano 1201) or in our office upstairs in the TLI Lounge (Solano 2230). As the Instructional Technologist – Accessibility Lead for our team, I’m very excited to highlight our newest service CI Universal. As you know, CSUCI is committed to making content accessible for all students and faculty. To support this effort, TLI has adopted an accessibility checker and a document converter and bundled them together to create CI Universal. The accessibility checker is embedded directly into all CI Learn courses. By now you may have noticed small gauge icons next to your files and images; those gauges tell us the “accessibility health” score of that item but don’t worry these only appear on the instructor side. Students do not see them. Additionally, the checker also generate alternative versions (available for faculty and students) which allows those enrolled in the course to choose the type of file that best suits their needs. However, keep in mind that the quality of the alternative formats are based on the score of the original file. 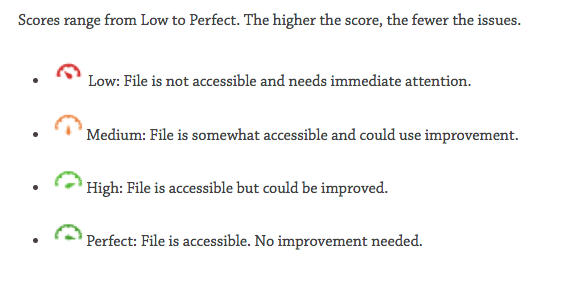 The better the accessibility health score is of the original file the better the alternative formats created will likely also be. The document converter (second part of the process) is also available in CI Learn. Faculty and students can access the file converter from within CI Learn by clicking the ‘Help’ link in the global navigation menu and then choosing, CI Universal File Conversion. By clicking on the icon you will be taken to an online submission form to attach the file or files you need converted to be more accessible. The submission process only takes four steps. Attach and upload the file(s). Once the files have been converted they will be emailed back to you and you can then replace the current versions with the converted files. We highly recommend that you submit the files so that all your students can benefit from the improved versions. If a student submits the file then only that student will benefit from it. Lastly, I wanted to make you aware of the CI Universal for Students support doc that we created that walks students through how to access the alternative formats of course files in CI Learn and how to submit files for conversion. For more in-depth information regarding the Accessibility checker and the file converter, refer to our CI Universal-eGuide. My hope is that we can all benefit from this service. The CI community is diverse. We all learn differently. Embracing our differences. Learning together. Love this blog post Kristi! Can you share what you turned on to do the accessibility health checker? This was so cool when I worked on the Learning 101 course. And, is your form converter a tool or do you do them for faculty manually?